I recently returned from a trip to St. Augustine, Florida with my fiancée, who — like myself — is a Florida native. I’d been to the historic town of St. Augustine before, whereas she had never been. In case you’ve never heard of St. Augustine, you may be surprised to learn that it’s the oldest European-settled city in the United States. 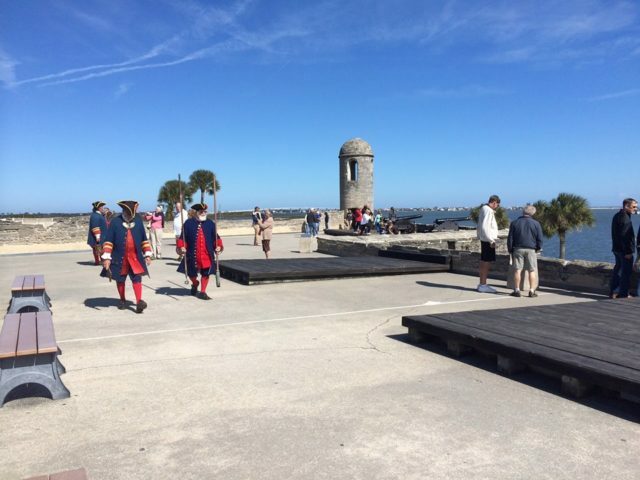 Located in the area where Spanish explorer Juan Ponce de León first landed in 1513 and established in 1565 by Spanish admiral and explorer Pedro Menéndez de Avilés, St. Augustine is even older than Jamestown, Virginia, which didn’t come along until 1607. St. Augustine may be paradise for history buffs, but the city’s appeal goes beyond those who love antiquity alone. 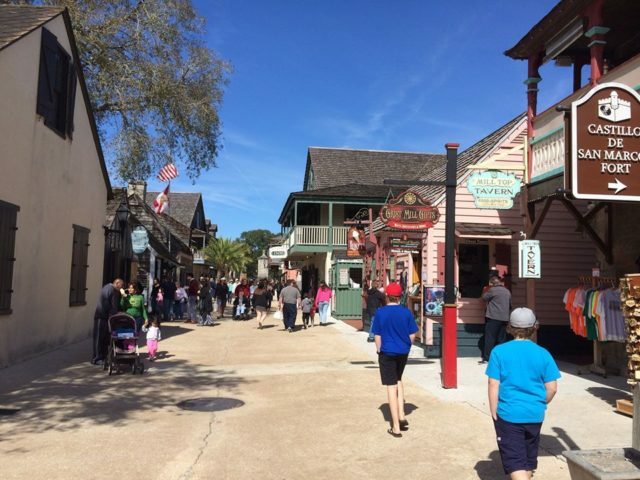 Shoppers, beach goers, and fun-seeking tourists in general all love St. Augustine, a city that’s a perfect vacation spot for just about everyone. I’m a history buff, and so is my fiancée, but she also loves shopping. We both have fun sightseeing and visiting attractions. We enjoyed our day trip to the city, which is only a 3-hour drive away from home for us but is also a popular destination for visitors from all around the world. There’s so much to see in Saint Augustine, Florida that it can be hard to decide what to do — especially if you have only a couple days to enjoy the town. 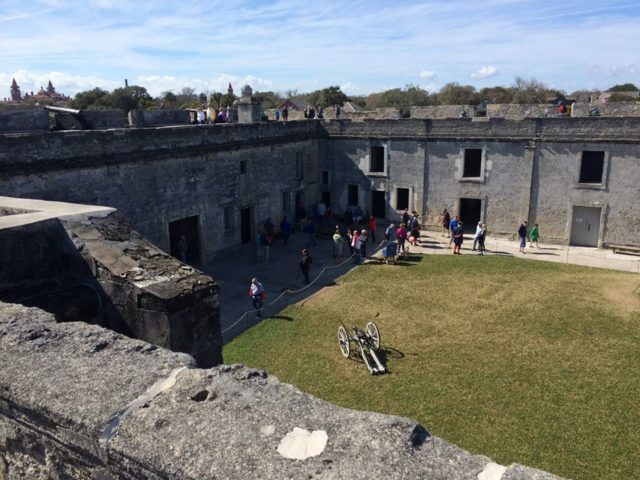 A relic of Spain’s early explorations of the Americas, the Castillo De San Marcos fort is the only existing 17th century masonry military structure in the United States. It’s also 1 of just 2 forts in the world made from a rare form of limestone called coquina; the other coquina fort is Fort Matanzas National Monument, which is 14 miles to the south. Construction on the fort began in 1672 and was completed in 1695. The fort saw action when the city was besieged by English colonial forces in 1702. The British forces, unable to destroy the fort, burned the city to the ground in 1702 upon retreat. That’s why no other existing building in St. Augustine dates to before that time. You can go on your own self-guided tour or let the park rangers take you through on a scheduled tour. I suggest allowing at least an hour to tour the fort, which has 2 floors and several rooms and exhibits. 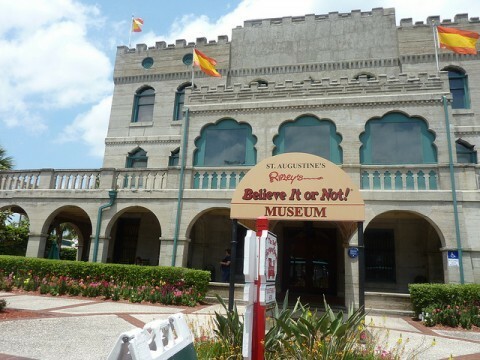 Ripley’s Believe it or Not Odditorium in St. Augustine is a collection of 300 exhibits and 19 galleries spanning 20,000 square feet. You’ll see everything from shrunken heads to a 7-foot-tall pirate made of car parts. My favorite exhibit is the operating Erector set Ferris Wheel, which stands 2 stories tall. It’s possible to see everything in the museum within 2 hours. 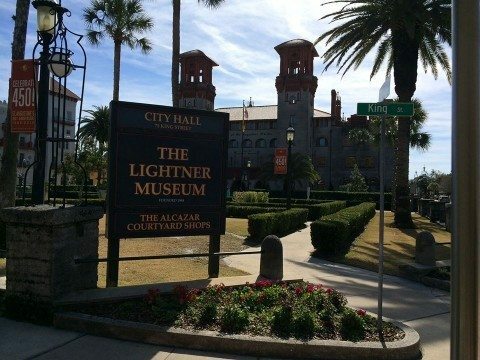 Ripley’s also offers a ghost train adventure tour through St. Augustine — which, according to many, is a haunted city. I’ve not been on the Ripley’s St. Augustine ghost tour yet, but according to several people I spoke to, it’s something you must do if you love anything having to do with ghosts. If you’re a fan of the Gilded Age, then a trip to the Lightner Museum is for you. The building, originally constructed by railroad magnate Henry Flagler as the Hotel Alcazar, the Spanish Renaissance-style structure is now filled with relics from the 19th and early 20th centuries — including Tiffany lamps, antique furniture, ornate statues, and classic music instruments. The museum grounds provide grand views of the historic building’s architecture, and you can stroll the outdoor courtyard inside the former hotel — where you’ll find a serene koi pond and charming footbridge. Located near the city gates, the oldest wooden schoolhouse was built sometime around 1716, when Florida was still under Spanish rule. The walls are made from bald cypress and red cedar. They were built using wooden pins and iron spikes. The classroom is located on the first floor. On the publicly inaccessible 2nd floor is where the school master and family would have lived. On the park grounds are a wishing well, the school kitchen, and an outhouse. The oldest wooden schoolhouse can be viewed by self-guided tour, though there is a robotic teacher and student who will tell you more about daily life at the schoolhouse. The schoolhouse can easily be toured in full within 45 minutes. The St. Augustine Lighthouse & Museum exhibits a significant aspect of the city’s maritime history. First constructed in 1871, the lighthouse is a prominent and beloved landmark just to the east of downtown St. Augustine and only a stone’s throw from the Atlantic Ocean. If you can ascend a spiral staircase consisting of 219 stairs, then you can climb to an observation deck atop the 165-foot-tall landmark. The Keeper’s House is located just steps across from the lighthouse. The museum still operates the Fresnel light, and the lighthouse is now classified by the U.S. Coast Guard as a private aid to navigation. We climbed the St. Augustine lighthouse on a particularly clear and crisp day, and the favorable weather conditions allowed us to see the skyscrapers of downtown Jacksonville, about 40 miles to the north. The historic downtown area in St. Augustine is very walkable. If you park at the main public parking garage by the , you’ll be able to walk to everything I’ve mentioned here (except for the lighthouse) in about 10 minutes. I’ve personally used the Old Town Trolley Tour both times I’ve visited the city so far. As I understand, both tours are roughly similar. Both trolleys offer narrated tours of the city, and each picks up and drops passengers off at various stops around the city. 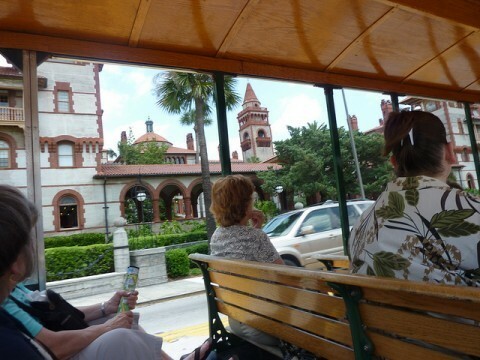 If you ask me, taking a trolley tour is the best way to get around the city of St. Augustine and allows you the opportunity to get a lay of the land before you start hitting the pavement.